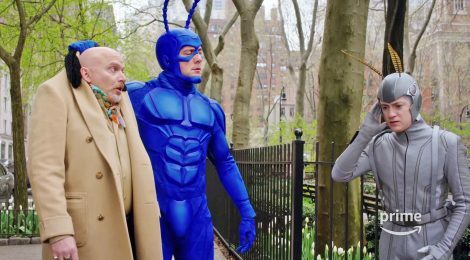 TV Review - Amazon's The Tick Season One - Honk if you love justice! I mentioned this when I talked about the pilot episode, that it amazes me that The Tick keeps getting chances. The latest show, on Amazon, is the third time the hero has appeared on our screens. Not bad for a hero that was created a mascot for a comic book shop. The comics that came from that, and the original 3 seasons of cartoons on Fox helped launch creator Ben Edlund’s career. He’s written, produced and directed some of nerd-dom’s favorite projects, including Supernatural, Angel, Firefly, the Venture Brothers and more. This version of The Tick is a bit darker and dare I say grittier than the previous televised versions, while at the same time skewering dark and gritty comic shows. The Tick himself doesn’t know who exactly he is, other than being The Tick. Arthur, too, has some mental issues stemming from a traumatic childhood. He saw The Terror kill both his father and his favorite heroes. So yeah, pretty dark, but don’t worry – there’s plenty of the trademark humor to be had. They even manage to make product placement funny, with the The Terror intoning “Alexa, play ominous music!” at one point. They parody Superman and the Punisher (who’s been a frequent target of Edlund’s in the previous Tick incarnations), and there’s even a giant naked guy just wandering around. Ms. Lint, one of the primary villains, still lives with her ex and the relationship definitely recalls the American Maid/Die Fledermaus interplay. If there’s a negative, it’s that the humor may not be for everyone. The show definitely leans into the absurdist nature of universes populated by talking super-dogs and hundred year old villains. It’s also a bit jarring to see the level of violence in a show about The Tick. The suit looks terrible in the pilot episode, but that was fixed for the rest of the series (and doesn’t pass uncommented). I had some trepidation about this but by the end I was fully on board. Peter Serafinowicz is a great Tick, Griffin Newman and Valorie Curry work well as Arthur and Dot, and the rest of the ensemble do their part.